Several parents have called the district administration offices and schools with concern of what our district is doing to protect your children and prevent the spread of the flu. Please know that as the district head nurse I speak with the Burlington DPH nurse on a daily basis. We do not currently have any atypical concerns in our schools and we took steps several months ago with the retraining of the custodial staff on the correct cleaning process of our schools to prevent the spread of the flu. We have created this educational email to assist you in your understanding of the flu and the actions our district is taking. The health and safety of your children are always our priority. DPH has reported 6 confirmed flu cases in Burlington between the dates of February 2nd and 12th in children under 18 years of age. Flu is a disease of the body’s breathing system, including the nose, throat and lungs. Flu is short for “influenza.” Flu is caused by a virus. In New England, the yearly flu season usually begins in the fall and lasts through March. Flu that occurs every winter season is called “seasonal flu.” New and very different flu viruses that appear every 30-40 years, like the H1N1 flu virus in 2009, are called “pandemic flu.” Seasonal flu and pandemic flu have similar symptoms, are spread the same way, and are prevented the same way. The most common symptoms of flu are fever, cough, and sore throat. Symptoms can also include body aches, headache, chills, runny nose and feeling very tired. Some people, especially young children, also have diarrhea and vomiting. Symptoms last from a few days to up to a week or more. Yes, flu can be very serious. Every year in the U.S. seasonal flu causes thousands of hospital admissions and deaths. Some people are at higher risk of serious health problems when they get the flu. This includes pregnant women, infants, the elderly and people with medical conditions like asthma, diabetes, heart disease, kidney disease, neurological and neuromuscular conditions and weakened immune systems. The flu virus is in the wet spray (droplets of saliva and mucus) that comes out of the nose and mouth of someone who coughs or sneezes. If you are close enough to a person with the flu (3 – 6 feet) when they cough or sneeze, you can breathe in the virus and get sick. Flu symptoms start 1 – 4 days (usually 2 days) after a person breathes in the virus. Flu is spread easily from person to person. The virus can also live for a short time on things you touch like doorknobs, phones and toys. After you touch these objects, you can catch the virus when you touch your mouth, nose, or eyes. Adults with flu can spread it from about one day before symptoms appear to about one week after. Children can spread the flu even longer after they get sick. There are drugs available that your doctor may prescribe to treat flu. The drugs work best if started soon after symptoms begin. Your doctor can determine if you need treatment. People sick with flu should make sure to drink plenty of fluids, get plenty of rest, eat healthy foods, wash their hands often and stay home to avoid spreading the flu to other people. Over the counter pain relievers may help people with the flu feel more comfortable. Children and teens with the flu should never take aspirin, because a rare but serious disease called Reye syndrome can occur. Do not give cough or cold medicines to children younger than 4 years of age. What do schools need to do for cleaning and preventing the spread of the Flu? It is important to match your cleaning and disinfecting activities to the types of germs you want to remove or kill. Most studies have shown that the flu virus can live and potentially infect a person for up to 48 hours after being deposited on a surface. However, it is not necessary to close schools to clean or disinfect every surface in the building to slow the spread of flu. Also, if students and staff are dismissed because the school cannot function normally (e.g., high absenteeism during a flu outbreak), it is not necessary to do extra cleaning and disinfecting. Flu viruses are relatively fragile, so standard cleaning and disinfecting practices are sufficient to remove or kill them. Special cleaning and disinfecting processes, including wiping down walls and ceilings, frequently using room air deodorizers, and fumigating, are not necessary or recommended. These processes can irritate eyes, noses, throats, and skin; aggravate asthma; and cause other serious side effects. What can you and our schools teach your children to assist them on preventing the spread of the flu? Influenza (flu) and other serious respiratory illnesses, like respiratory syncytial virus (RSV), whooping cough, and severe acute respiratory syndrome (SARS), are spread by cough, sneezing, or unclean hands. Please refer to these brochures! Red Light Symptoms: Children don’t attend school! Fever (100.0 or higher), diarrhea, vomiting, or sore throat (sore throats could be strep, which is highly contagious). Children need to be free from these symptoms for 24 hours before returning to school. If a child is taking an antibiotic they need to be on it for a full 24 hours before returning to school. Also, red or pink itchy eyes with crusty and/or green/yellow drainage should be evaluated by a physician — child may return to school the day after he/she is examined by a physician and treatment has begun. If your child has any type of flu symptoms (fever, chills, body aches, low energy) please keep them home from school. The nurse also has the discretion to send a student home with a rash of unknown cause that needs physician evaluation and clearance to return to school. Yellow Light Symptoms: Children could or could not attend school; you need to use your best judgment. If your child has cold symptoms and you feel they should go to the doctor, please keep them home from school. If your child has a runny nose that is green and thick or a severe/hacking cough, they should stay home. If your child has a bad cold, has no energy or requires any type of medicine to get through the day, they should probably stay home. Remember, children are not available to learn if they aren’t feeling well. Green Light Symptoms: Children can attend school. Your child has allergies and has a clear runny nose or mild cough. Your child has been sick but is feeling better and has been fever-free for 24 hours (not taking fever-reducing medication). If your child has been sick and has been put on an antibiotic, they must be on the antibiotic for a full 24 hours plus fever-free for 24 hours (not taking fever-reducing medication). We request that you call your child in sick if they are going to miss school. Please include in your message what is wrong with your child. This is helpful for us to track different types of colds, viruses and infections going around. If your child has had a fever or is contagious, i.e. strep, flu, please call your Nurse’s office. Working together, we can prevent the spread of the Flu and thus decrease the number of cases of the flu. Please feel free to contact me with any questions or concerns. We, as a district, appreciate your understanding and joint efforts in keeping our community healthy. With the uncertainty of tomorrow’s predicted snow and its timing, I wanted to warn you of the possibility of an early dismissal. If Dr. Conti calls for an early dismissal of the Burlington Public Schools on Wednesday, February 7, all BECC students will be dismissed at 11:30 AM, and there will be no afternoon preschool. Nothing is certain at this time, however, I wanted to give you time to make preparations if needed. At this time, Dr. Conti is watching the weather and will make a decision when he has more information about the track of the storm. Kindergarten Parent Information Night is scheduled to take place at the Burlington High School Auditorium, Wednesday, January 17th, 2018 at 7:00 pm. If school is canceled in Burlington on January 17th, the event will be moved to January 18th at the same time and place. The Burlington Public Schools will be holding an information night for parents of incoming kindergarten students. At this informational evening, you will learn about what a typical day in kindergarten looks like. We will review registration procedures, kindergarten screening, and overall kindergarten readiness. There will also be time allotted for Q & A. Please join us for this important evening. Please note: this evening is for parents/guardians only. 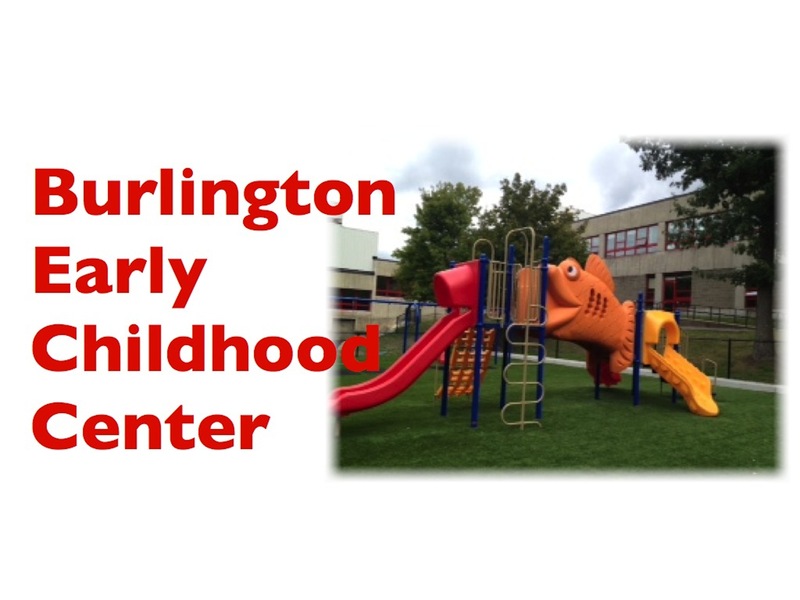 The Burlington Early Childhood Center (BECC) will be hosting an Open House for new students on Friday, January 19, 2018 from 1:00 p.m. to 2:00 p.m. The BECC is an integrated public preschool for children ages 3-5. We support children of all abilities in both general education and special education settings. We also provide support in the areas of speech-language, motor, and social skill development. Our Open House will provide families with an opportunity to view our programs, meet the teachers, and pick up registration packets to enroll their children for the 2018-2019 school year. Students must be 3 years old by August 31, 2018 to be considered for enrollment for the fall of 2018. Just a reminder that Wednesday, November 22nd is a half-day of school for the entire Burlington School District. All BECC classes will be dismissed at 11:30 AM. There will be no afternoon classes on Wednesday. The BECC will be closed on Thursday, November 23rd and Friday, November 24th for the Thanksgiving Holiday. Also, students will not have school on Thursday, November 30th as this is Parent Conference Day. If you have any questions, please call us at 781-270-1808. Since 2009, caring classrooms across the country have risen to the challenge and donated nearly 400,000 pairs of new pajamas. The Scholastic Reading Club has more than matched those numbers with nearly 700,000 new books donated directly to Pajama Program headquarters, where they are then distributed across the country by Pajama Program. If you and your child are able to participate, please have your child bring in a new pair of pajamas to school by___December 7, 2017. Just a friendly reminder that we continue to go outside to play in the colder weather. Please be sure to send your child to school wearing appropriate clothing for the cool temperatures. Keep in mind that classrooms go outside throughout the school day. Weather permitting, we will be outside when the temperature is above 25 degrees. Please make sure that your child is dressed appropriately for the weather including wearing a winter coat, hat, and mittens when necessary. Just a reminder that all of the Burlington Public Schools will be closed Thursday, November 9th (professional development) and Friday, November 10th (Veteran’s Day observed). The BECC will be back in session on Monday, November 13th. Enjoy your long weekend! There is a two-hour delay today, Monday October 30th, for the Burlington Public Schools. All AM preschool sessions are cancelled. If your child is in the Cub Cadets with Lisa or the Kinderstars with Margaret, your child will have school from 10:30 AM to 12:30 PM. If your child participates in a full day program in the Puppy Pals, Busy Bees, or Dynamic Dinos, they will have school starting at 10:30 AM. If your child is dismissed at 11:30 AM, they do not attend on delayed openings.